Modern working life is hard. Practicing mindfulness can not only help you achieve the right balance, reduce stress and anxiety but also increase attention, self-fulfilment and productivity. 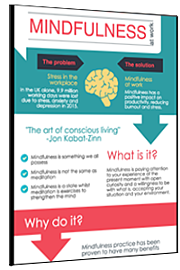 Fill out the form opposite to download this informative infographic and learn the fundamentals of mindfulness.